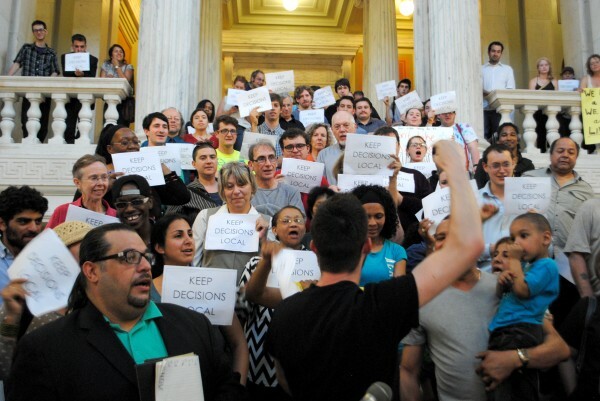 Early Tuesday evening, hundreds of Providence workers, activists and city officials gathered in Rhode Island’s capitol rotunda to protest four lines of text added to the state budget at the very last minute by Democrats on the House Finance Committee. The amendment, which passed through the finance committee last Thursday, would prohibit municipalities in Rhode Island from establishing their own minimum-wage laws. The Providence city council is currently considering an ordinance that would raise the minimum wage to $15 an hour for employees at large hotels. Other cities around the country like Seattle, San Francisco, and Santa Fe have passed or are considering minimum-wage hikes. City Councilman Luis Aponte, who emceed the statehouse rally, blamed “rich hotel owners who have deaf ears for those shoveling and cleaning” to keep their businesses running. Though supported by a majority of Providence voters, the wage ordinance had met well-heeled opposition from the Chamber of Commerce and the Rhode Island Hospitality Association (RIHA), who testified against the bill at a City Council hearing in May. Providence mayor and gubernatorial candidate Angel Taveras had called for a study to determine the economic impact of raising hotel worker wages. For the opposition, the budget measure was a blessing, averting the wage increase regardless of what plays out in the city council. This sort of legislative “pre-emption,” has become a popular tool for conservative legislatures seeking to rein in more progressive cities. In April, Oklahoma joined ten other states in passing a pre-emptive labor law, blocking efforts in Oklahoma City to raise the minimum wage to $10.10. Lawmakers in Washington have proposed a similar measure to undermine the $15 minimum wage recently passed in Seattle. In many of these cases, the American Legislative Exchange Council has provided guidance, funding and even model legislation. In Rhode Island, however, where Democratic legislators outnumber Republicans ten to one, the story is a little more complicated—involving a likely collusion between conservative Democratic leaders and the business interests most staunchly opposed to the wage ordinance. Though it was Democratic Representative Raymond Gallison, chair of the house Finance Committee, who slipped in the budget amendment, many suspect House Speaker Nicholas Mattiello—who took over the top spot in March after state and federal investigators derailed the career of his predecessor—played a heavy hand in pushing the measure. Since 2010, Mattiello has received multiple campaign donations from both RIHA and the Providence Chamber of Commerce—the two main forces aligned against the hotel workers’ wage initiative. The Procaccianti Group, which owns three hotels in downtown Providence, is headquartered in Cranston. Sam Bell (no relation), State Coordinator of the RI Progressive Democrats, has ceased to be surprised when top state Democrats betray the left flank of the party to side with big business conservatism. “This is not an aberration. It is part of a bigger picture,” he said. The $8.7-billion budget also cuts corporate taxes from 9 to 7 percent, and raises the estate tax exemption from $922,000 to $1.5 million. On Thursday the full House will vote on the proposed budget, and the Senate soon after. Lawmakers will have the opportunity to vote against pre-emption, and supporters of the wage ordinance will be watching closely to see who is willing to defy the Speaker.